Can more than 10 delegates attend..? To ensure delegates are trained to the required quality and standard, we use one trainer for up to 10 delegates, however, training for larger groups can be arranged with additional trainers. Dependant on the experience of the delegates, depends on the length of the course, however, the course generally lasts between 4 and 6 hours. The correct use of wheelchair tiedown/anchor training and occupant restraint safety systems can be delivered On-site, with the best practice operational use of passenger carrying lift training. 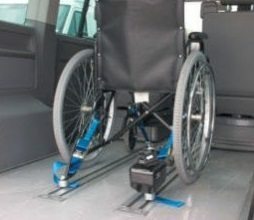 A duty of care to all passengers during transit is their unequivocal right, as it is the right, of staff responsible for passenger safety, to be trained and certified in the correct use of wheelchair anchor points/tiedown and occupant restraint systems(WTORS), and the use of passenger lifts. It is a legal requirement for companies, under section 2 of the Health & Safety at Work Act 1974 to provide the correct Information, Instruction and Training to their employees, in order for them to carry out their duties safely and competently. Accessible Ltd are the only true independent training company that instructs and trains in all of the wheelchair equipment manufacturers equipment. Manufacturer approvals – Unwin safety Systems, Koller Engineering, Nmi Safety Systems and Qstraint, Amf Bruns, PLS (passenger lift services) and Ratcliff Palfinger. Approved by Unwin Safety Systems. Approved by NMI Safety Systems. Approved by Passenger Lift Services. Approved by Ratcliff Palfinger Passenger Lifts. Standard and Bespoke training courses available, on site or at our Lancashire training centre, call us now for details. Frequency of thorough examinations for lifting equipment used to lift people. Under current LOLER regulations, there is a legal requirement where people are being lifted – whether the lifting equipment is designed to lift them or not – the equipment must be thoroughly examined at six-monthly intervals. Regulation 5 of PUWER requires you to maintain work equipment in an efficient state, in efficient working order and good repair. When did you last have your wheelchair tiedown/anchor equipment checked? Certificated training for up to 10 people, starting with a modern, interactive theory presentation, within a classroom, which gives the delegates an understanding of the forces that affect a wheelchair user in the unfortunate event of an accident, and the importance of utilising the equipment correctly, in line with manufacturers recommendations, and current safety legislation and best wheelchair tiedown/anchor training. Delegates will then move to practical demonstrations within the classroom, with actual hands on training, and then move outside to the actual vehicle and wheelchair tiedown/anchoring training equipment, to further reinforce the practical use of the wheelchair tiedown training and the equipment, and to duplicate the real life daily situations the learners will normally undergo, during the course of their normal working day, securing wheelchair users safely as per the wheelchair tiedown/anchor training procedures. As with Bronze training, with the addition delegates will also undergo learning on passenger carrying tail lifts, and the procedures to deal with lift failure loaded or unloaded, as is the case. As with Bronze, Delegates will then move to practical demonstrations, with actual hands on training, and then move outside to the actual vehicle. For instruction on correct operator use of the lift and its emergency procedures, and training in dealing with the different types of disabled passenger and the loading of them, prior to further tie down equipment instruction. Which will further reinforce the practical use of the wheelchair tiedown equipment, in order to duplicate the real life daily situations, the delegates will normally undergo, during the course of their normal working day. This will confirm a process of learning has taken place, in order for certification of the delegates. As with the silver training, with the addition of Equipment inspection and documentation. Wheelchair safety equipment is visually inspected and working parts tested, then serialised and documented to a database, in order to comply with the current HASAWA and PUWER acts of 1974. Price is dependent on volume of equipment.